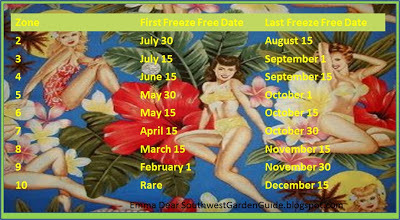 This vegetable garden First & Last Freeze Date Calendar below will help you plan ahead. It will help you succeed at having a bountiful garden or extending your garden's life according to your planting zone. I try and follow the First & Last Freeze Date Calendar to help me know when my seeds should be started indoors, when they should be started or transplant your seeds and seedlings outdoors. *Following the chart will give you a rought idea as to when to expect to harvest your seeds. Each vegetable has a variety of types, each one with a slightly different growing season, and length. In general, the information listed on your seed packets, at Burpee.com, Farmers Almanac or favorite gardening source can also be very helpful in as to when to start planting seeds indoors or outdoors. Remember.. seeds needs a particular degree of heat or coldness to either germinate and thrive after germination. The chart below is most helpful if you're needing to schedule a garden events, planting seeds outdoors, transplanting vegetables, harvesting determining if you should cover your last crop of tomatos or that sort of thing. For example, once the onions are harvested in the late summer, a quick growing cool weather crop such as lettuce, spinach, or beets could easily be grown where the onions once were before the first frost comes in. 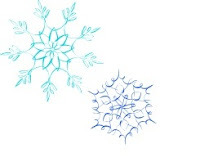 Frost can completely wipe out a vegetable garden. This allows an additional set of vegetables to be grown from the same garden plot or helps you know when to cover your crops so they won't get burnt from frost. So.. my advice is to pay attention to this First & Last Freeze Date Calendar then watch your local news for current weather updates.